Technically you can make an Ohio Star with just two colours (or even one, if you kept the central square the same as the points), but I think it looks much better with three. 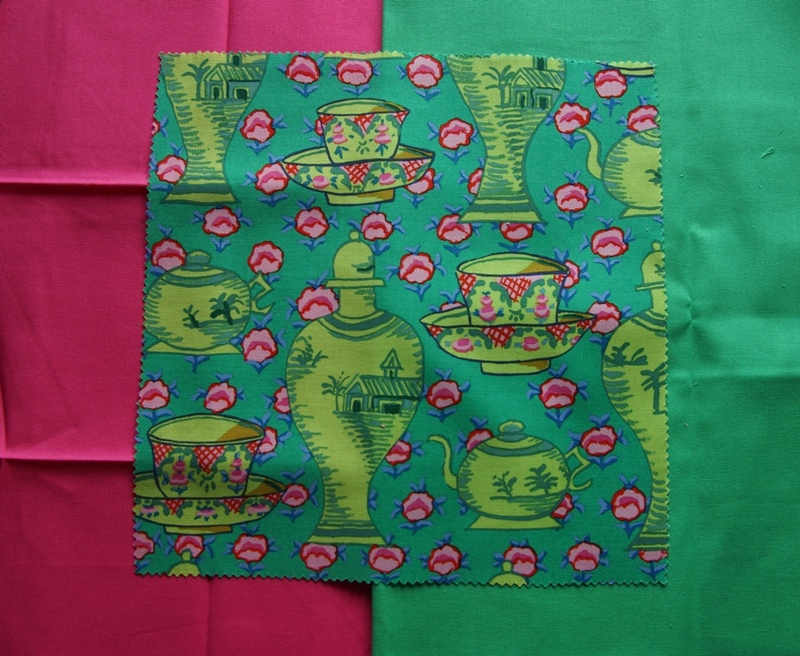 Pair one green* square with the pink* square, and the other with the large background square. 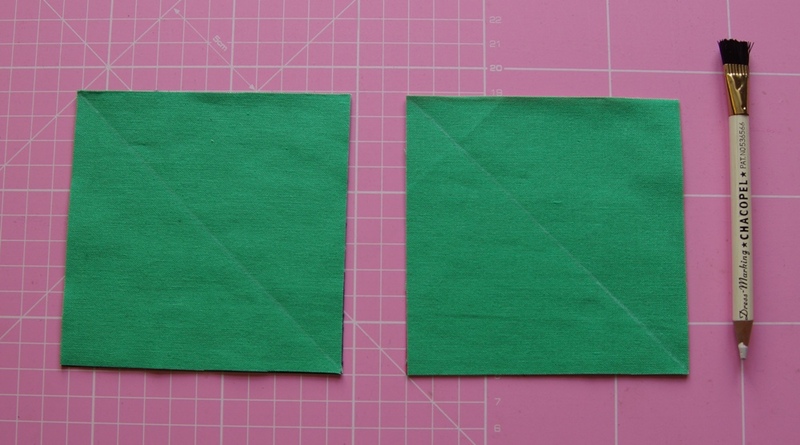 This is another way of making half-square triangles. 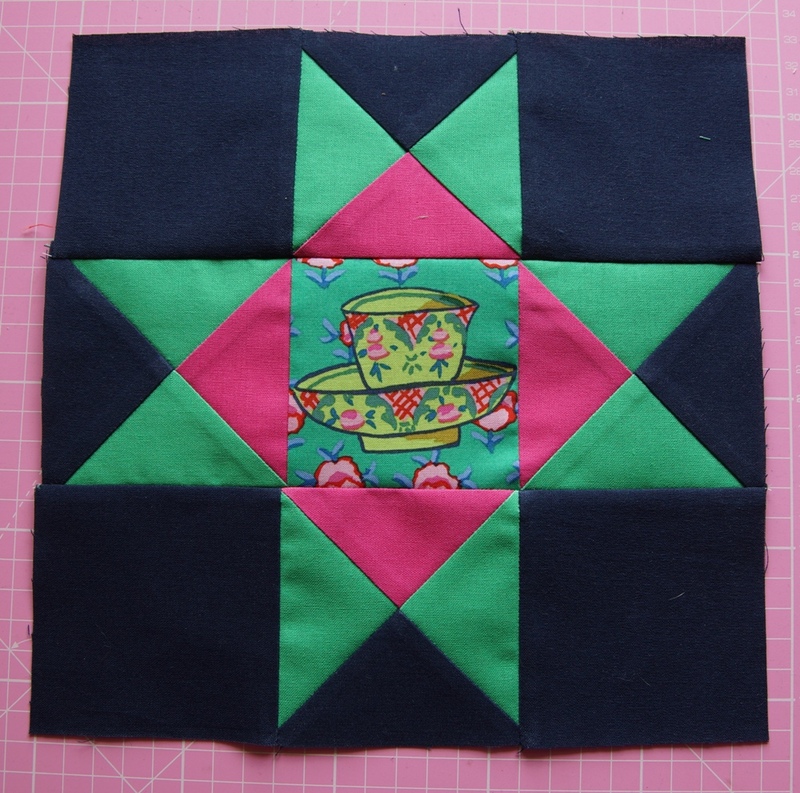 It only makes two at a time, which actually works out nicely for this block, and also doesn’t end up with bias edges on your block like the four-at-a-time method. 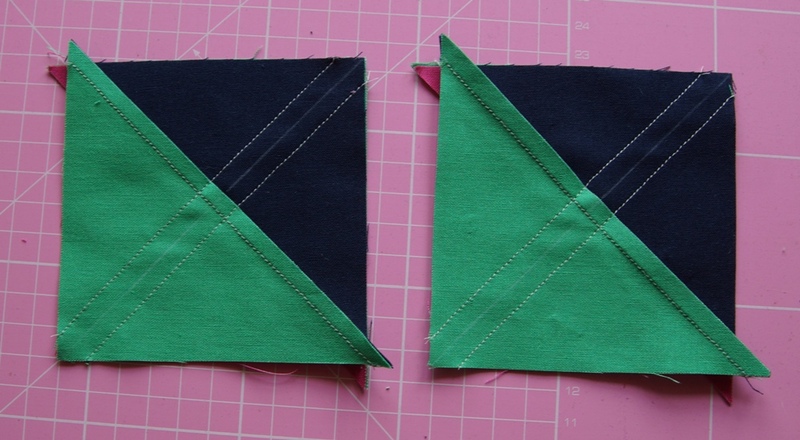 Draw a diagonal line across each pair (the line doesn’t show up very well in the photo, but I could see it pretty clearly in person), and stitch quarter of an inch either side of the line. 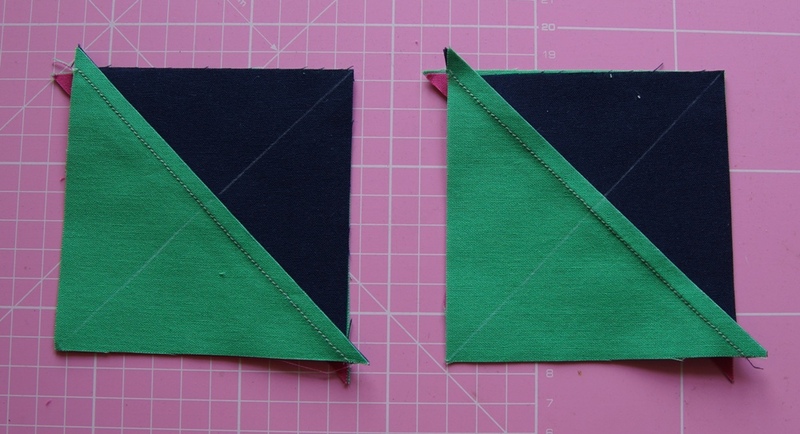 Cut along the drawn line and iron open, to get two half-square triangles of each colour combination. 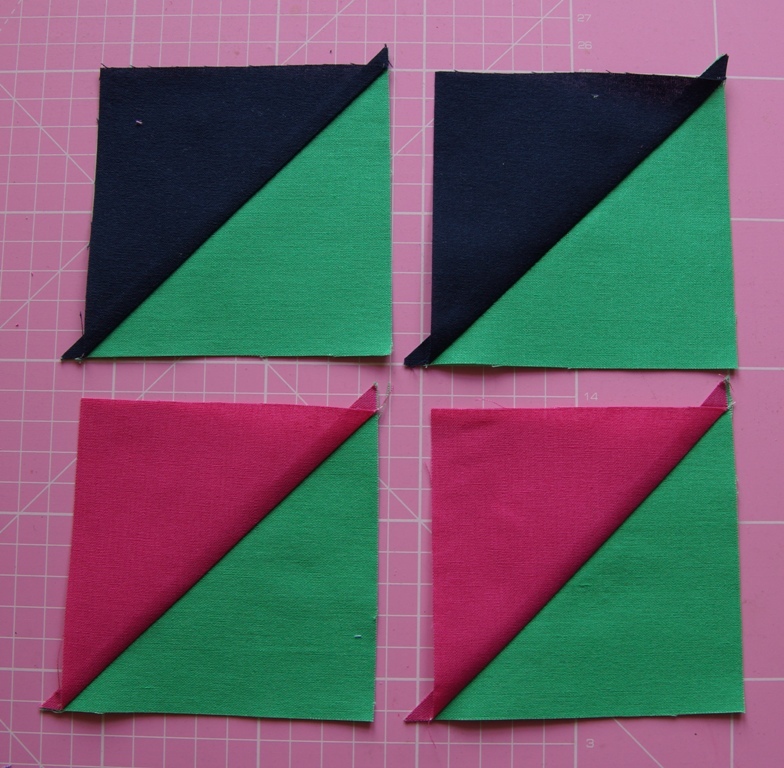 Now take each green/pink HST, and pair with a green/background HST, with the diagonals running the same direction, and the green on opposite sides. 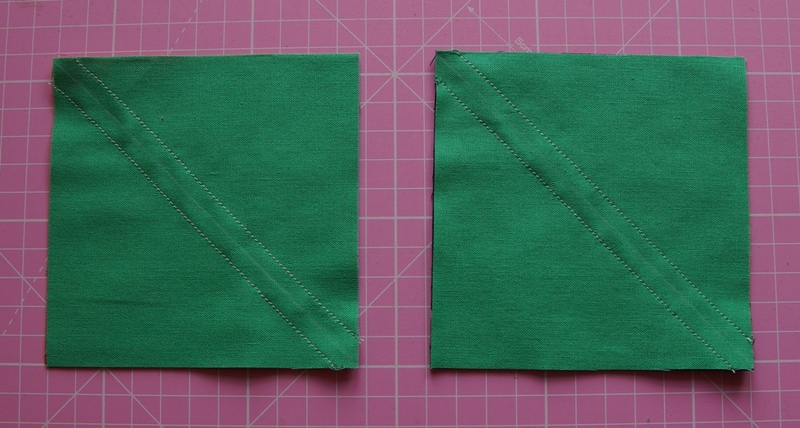 Draw a diagonal line in the opposite direction, and sew quarter of an inch on either side of the line. 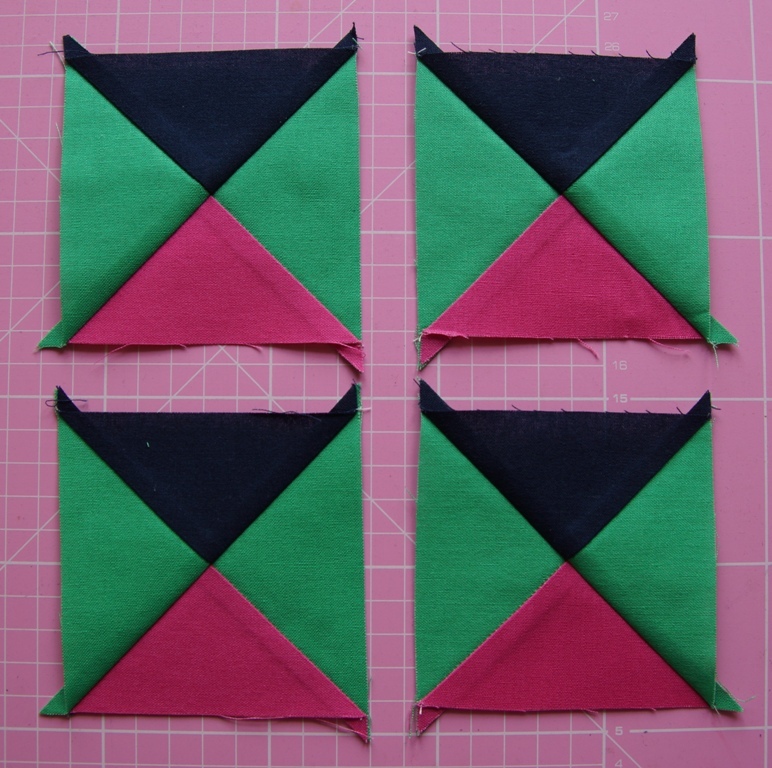 Cut along the lines and iron open, and you’ll have four quarter-square triangles. 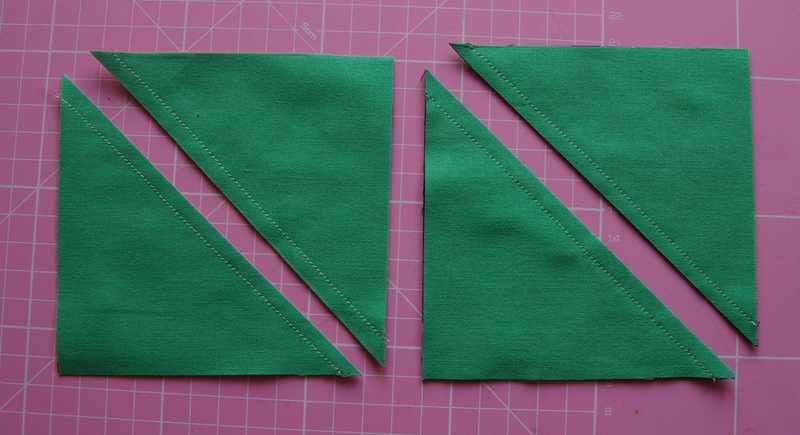 The quarter-square triangles should end up 3 1/2 inches square. 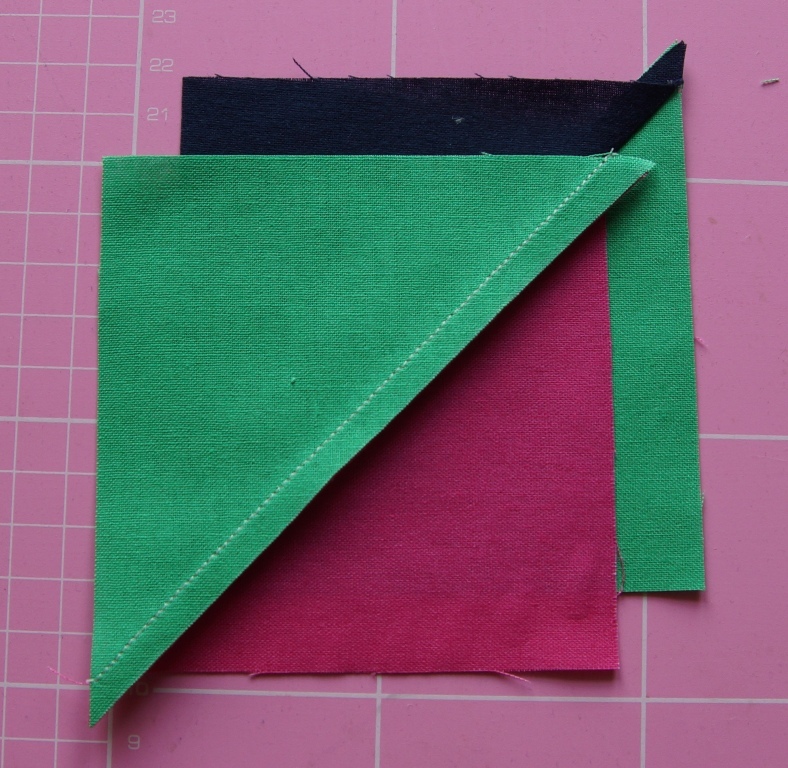 Trim off the dog ears, and lay out the block. 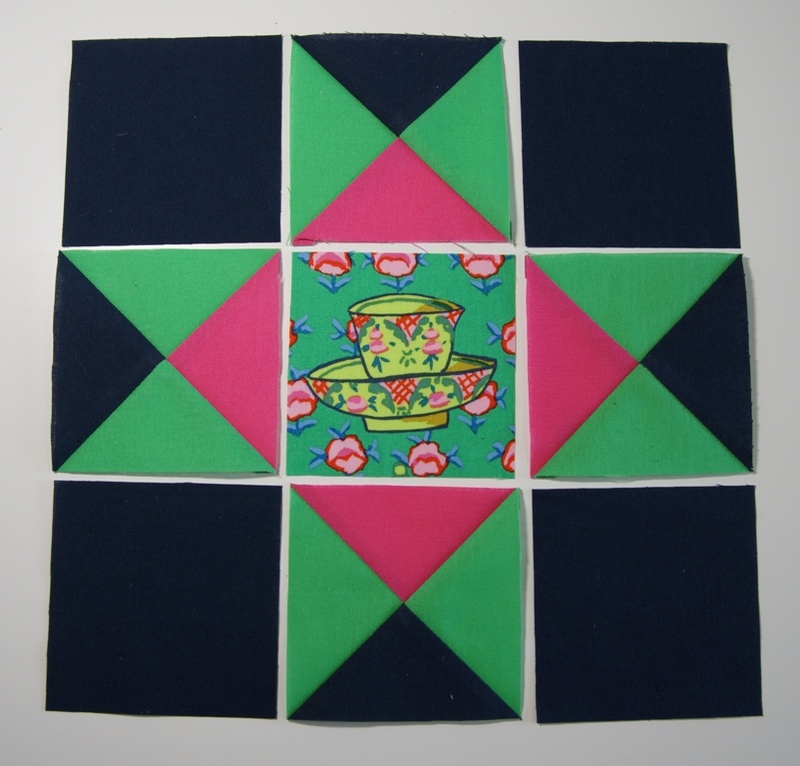 Sew together as a nine-patch, and you’ve got your Ohio Star. 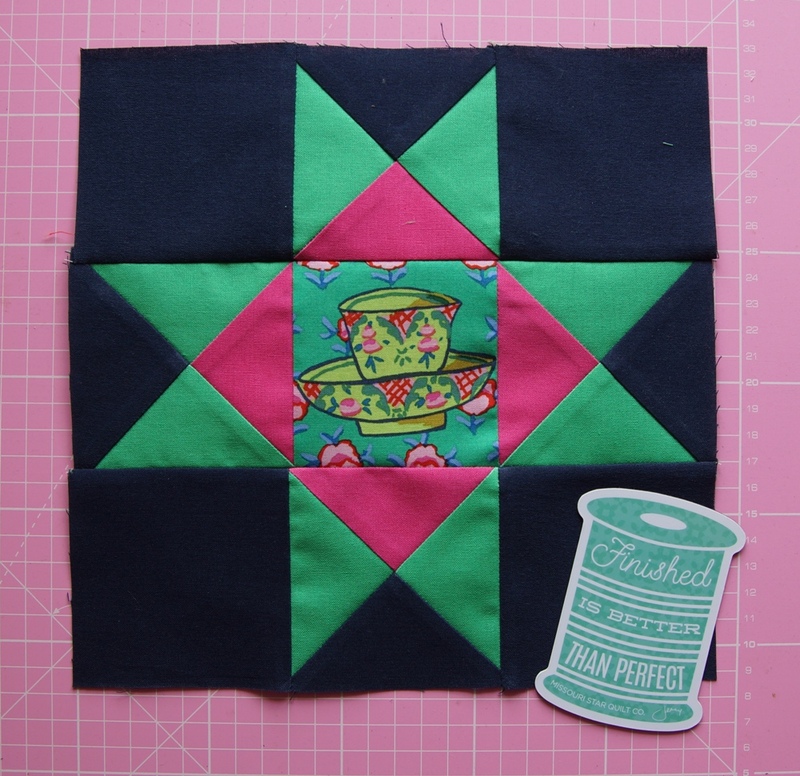 This entry was posted in Crafts and tagged Block of the Whenever, craft, patchwork by FutureCat. Bookmark the permalink.